India would be aiming to make the right selections against an unrelenting South Africa in the third and final Test. Johannesburg: India will seek to avoid a series whitewash when they play South Africa in the third and final Test at the Wanderers Stadium, starting on Wednesday. The Wanderers could live up to its reputation as a haven for fast bowlers, especially after South African captain Faf du Plessis expressed his disappointment with the slowness of the Centurion pitch where South Africa clinched the series last week. Two days out from the match, there was a generous covering of green grass on a surface baking under a hot sun, with groundsman Bethuel Buthelezi saying in a weekend newspaper interview that he was planning on preparing a "green mamba" -- which South Africans understand as a green pitch offering venomous assistance to seam bowlers. India, though, will be buoyed by their record at the ground. They have yet to be beaten in Tests there, with a win and three draws going back to 1992/93. On the one occasion where conditions were particularly bowler-friendly, in 2006/07, South Africa were beaten at their own game. Firebrand seamer Shanthakumaran Sreesanth took five for 30, South Africa were bowled out for 84 in the first innings and India went on to win by 123 runs. It remains one of only two Indian wins against 10 defeats in 19 Tests in South Africa. While bemoaning his team's poor batting in the current series, Indian captain Virat Kohli has hailed his bowlers, who have claimed 20 wickets in both Tests so far. This, he believes, gives India the ammunition to be competitive. Kohli himself has happy memories of the ground, having scored 119 and 96 in the drawn first Test in 2013/14 when South Africa, set to make a world record 458 to win, finished on 450 for seven, in a match which showed that batsmen can prosper at the Wanderers once the initial sting is drawn from the surface. Cheteshwar Pujara made 153 in the second innings of the 2013/14 match and India will be seeking an improvement from their number three batsman, who has made only 49 runs in four innings, including being run out in both innings in Centurion. Ajinkya Rahane, who did not play in the first two Tests, had a lengthy net at the weekend and could be recalled on the strength of a strong record in overseas Tests. Dinesh Karthik was flown in as a replacement for injured wicketkeeper Wriddhiman Saha and could play at the expense of Parthiv Patel, who had a poor game with the gloves in Centurion. 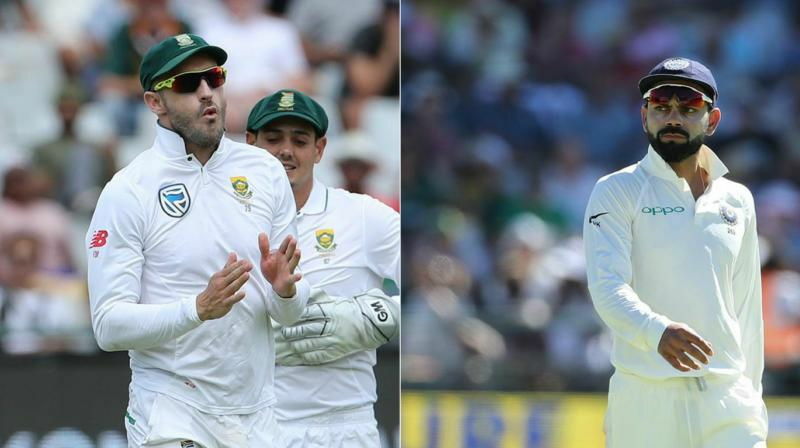 With their formidable fast bowling attack, coupled with more resolute batting and better fielding in the first two Tests, South Africa will again start favourites although they will be wary of a potential Indian backlash. Rain could interfere with play on as many as four days.